No one expected The LEGO Movie to be awesome, let alone one of the decade’s smartest animated films. Even I, an avid Lego collector from childhood to high school, was awed by its creativity and messaging back in 2014. It simultaneously played to the viewer’s expectations of a corporate product-themed movie while subverting the tropes and clichés expected from the done-to-death “chosen one” narrative. And you better believe the merchandise sold like crazy so even real-life Lord/President Business types felt pleased with the results. The LEGO Movie 2: The Second Part admirably captures its predecessor’s joyful, imaginative vibes but with a story that doesn’t feel quite as tightly executed. It’s unquestionably lovable but the surprise of watching a product like this surpass everyone’s preconceived assumptions is rarely possible to replicate. Hype always builds expectations and the satirical elements Phil Lord and Christopher Miller wove into their first entry doesn’t hit as hard when you’re expecting them to meet said expectations. In other words, they didn’t take the 22 Jump Street approach where the expectation of formulaic sequel tropes became the central joke. Here, Lord and Miller adopted simple writer/producer positions, letting director, Mike Mitchell, frame the action while the two original visionaries wrote the jokes. But, between the three of them, we still get an entertaining family adventure consisting of characters whose humor resonates with viewers of all ages. It’s not exactly a risk-taking sequel. The Second Part resembles its predecessor by having Emmet Brickowski (Chris Pratt) step up to save his friends from a potential doomsday threat in the far off cosmos, amusingly called “Our-Mom-Ageddon”. But the presentation and pop-culture riffing give this film enough charm to not feel like a total rehash. This film begins immediately where the last film left off with alien invaders from planet Duplo- an imagination-fueled side effect of Finn, the world’s human creator, having been forced to share with his sister- invading Bricksburg. Five years of cute but chaotic interruptions later, the world of Master Builders devolved into a gritty, Mad Max-inspired dystopia dubbed “Apocalypseburg”. Everything is, as they put it, “not awesome”. Environments are violent and rusted brown, locals dress like hardened marauders, and even Emmet’s punk Master Builder girlfriend, Lucy (aka Wildstyle, voiced by Elizabeth Banks), excessively broods daily. There’s still coffee, though, so not the worst of apocalypses. Yet Emmet remains exactly the same— a lovable, sweetly naïve construction worker who continues to wear his orange outfit and listen to obnoxiously catchy pop music. He doesn’t want to change his inner nature or “get with the times” because… well, that isn’t Emmet. Hell, he even bought a colorful dream house to share with Lucy, complete with hidden passageways and a room that makes unlimited toast. This harsh life is interrupted by the latest Duplo invader, General Sweet Mayhem (Brooklyn 99’s Stephanie Beatriz) of the Systar System. She kidnaps Lucy and Batman (Will Arnett), along with supporting cast members Unikity, Metalbeard, and Benny, the spaceship-obsessed 1980’s spaceman, for a grand matrimonial ceremony honoring the shapeshifting Queen Watevra Wa’Nabi (Tiffany Haddish). Wa’Nabi intends to wed Batman because Batman is an angsty and emotionally distant loner whose solo movie called out his aversion to companionship. With his friends seemingly in danger, Emmet tails them through the stairgate (yes, it’s a 2001 parody) and across the galaxy in pursuit. 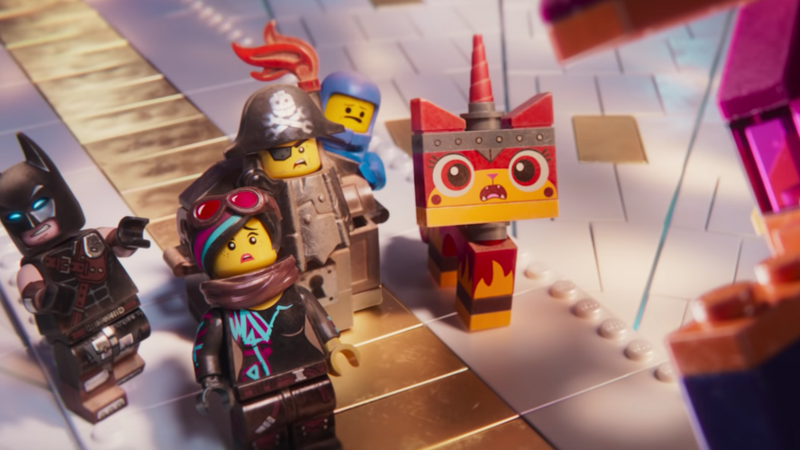 Part of The LEGO Movie’s genius is its metaphorical juxtaposition between the fantasy setting and real-world conflicts. This is a universe made out of Legos built from one kid’s imagination but the plot is a mirror for the live-action builder’s owner’s household grievances. Emmet’s transition into “the Special”, later revealed as a fabricated prophecy, which he nevertheless turns into an empowering message of creativity and collectivity reflects Finn’s own struggle to connect with his “by the instruction book” Lego-collecting father. Here, the overarching theme is one of growing up, both in Finn’s real-life ambivalence to playing Legos with his sister and in Emmet’s struggle to “man up” into someone who doesn’t treat life as a happy-go-lucky experience. That confidence tutorial comes in the form of Rex Dangervest (also voiced by Pratt), a grizzled action-man/galactic hero/archeologist/raptor trainer/cowboy and ultimate parody of Chris Pratt’s IMDb page. After all, he has a spaceship-like Star-Lord, except the crew is made up of weaponized raptors. It’s fun to watch Pratt bounce these ludicrously opposing personalities against one another, alongside all the psychoanalytical meta jokes one comes to expect from Lord and Miller’s writing. But there’s a second twist to this dynamic that makes it even more intriguing. Without spoiling anything, it overturns gritty action hero archetypes through a critique of our expectations regarding character growth, maturing Emmett while having Lucy and the supporting cast recognize the importance of not pushing him to become a minifigure he’s not. Like the Lego movies before it, The LEGO Movie 2’s comedy comes from its visual zingers and pop culture references. The background gags are hilarious when you spot them and I was amazed by how many pop culture figures made it into the final cut. These range from Ruth Bader Ginsburg as a wedding guest to Jason Momoa re-voicing his gleeful dude-bro Aquaman and even a sparkling vampire stylist mocking that awkward late-2000’s phase when everyone was obsessed with Twilight. There are even some surprise Lego Bruce Willis cameos (in air vents, no less) that I somehow found more memorable than his screen time in Glass. I also appreciate the use of Duplo and ‘Lego Friends’ figures as part of the aesthetic, lending itself to a setting that’s just distinct enough from the world Emmet and his friends inhabit. They’re very quick, “blink and you’ll miss them” jokes, but funny ones all the same. 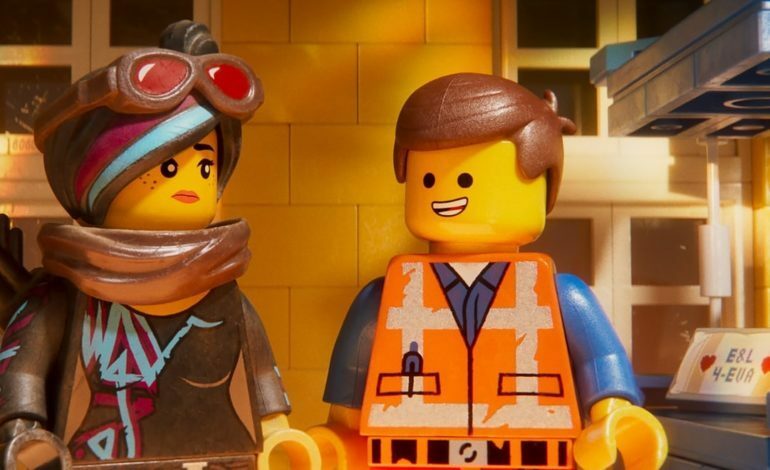 Compared to the first film, however, where the story found a sweet spot appeal between younger and adult viewers, The LEGO Movie 2 is definitely targeting kids. There are a lot more self-aware musical numbers, glittery aesthetics, and a live-action plot that’s bound to resonate more with siblings than with parents. It also borrows one too many live-action/animated parallels from the first movie’s climax, something that risks becoming repetitive if this franchise becomes a trilogy. None of this is a deal breaker. I’m almost 23 and still had a big grin on my face watching this film, even during the credits. But seeing the action halt itself to call out real-world parallels felt more jarring this time around, conveying the thematic elements at the cost of a slightly uneven climax. A simple warning to The Lego Movie 2, you’re a franchise about subverting expectations. Try to avoid falling victim to your own clichés. I’d rank The LEGO Movie 2: The Second Part as “good” rather than “awesome” but still recommend it to any fan of the franchise. 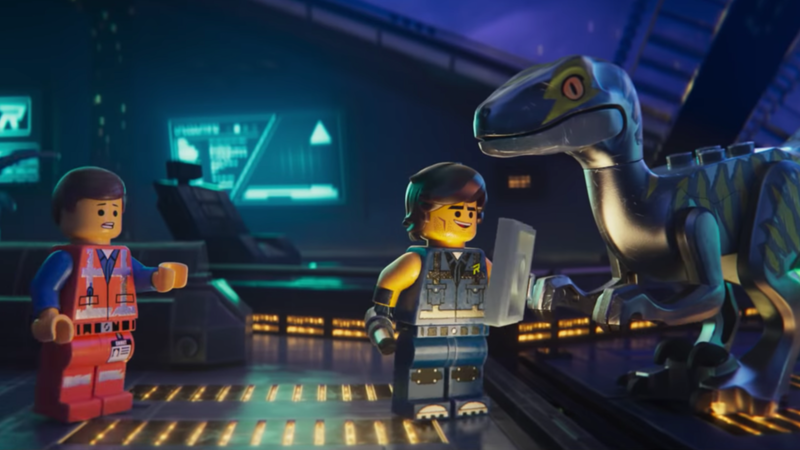 There are funny jokes, likable characters, and a fantastic animation design that expands the worldbuilding elements of this homegrown Lego universe. It just doesn’t stand apart from other animated films the way its predecessor did five years ago. Honestly, it would take egregious corporate maneuvers for someone like me to turn their back on a Lego movie. As long as Lord and Miller continue to have a hand in writing them, I won’t reject a Lego movie anytime soon.